The United States Conference of Mayors concluded its annual winter meeting in Washington, D.C. today. Bay State mayors and city representatives were present at the three day event which began Thursday. They were joined by mayors and other politicians from around the country including Vice President Joe Biden and New York Mayor Michael Bloomberg. It was a time to network and share ideas. Attleboro Mayor Kevin Dumas learned he could obtain funding for school safety through the Department of Justice’s Community Oriented Policing Services (COPS) program. He and others discussed how to lobby Congress to apply for over four billion dollars into school safety plans, school resource officers and other needs that he can bring back to his district. 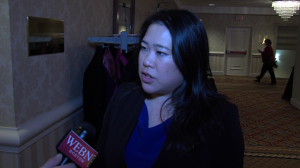 Fitchburg Mayor Lisa Wong was happy to learn the Conference created an advanced manufacturing task force. Other city leaders also met to address topics like hunger and homelessness. Boston’s Director of Partners and Partnerships Howard Liebowitz attended the event as the Hub’s liaison and represented Mayor Tom Menino’s food policy task force. He explained that dealing with food issues is relatively new for cities. As far as ideas of what he’ll be bringing back to Boston, Liebowitz said he heard “some interesting ideas” for addressing mental health issues.